Elechomes - CH601: Humidifier Review • The Air Geeks, reviews of air conditioners, dehumidifiers and air purifiers. Looking for a stylish modern design humidifier to keep your house or office moisturized throughout the day? Look no more, as this Elechomes Ultrasonic Humidifier CH601 will ensure you have a relaxed mind and good health free of flu, allergies and moisturized skin. You can choose between cool or warm moist hence it can work in all weather types and giving you options without having to purchase a different humidifier. Elechomes Ultrasonic Humidifier CH601 is a large-room humidifier with a 6L (1.53 gallons) capacity capable of running for a whole day without the need for a refill on low setting. At 250ml/h on the cool mist and 550ml/h on the warm mist, it should get your skin protected from dry air and flu virus kept at bay. Weighing at only 2.2kg, this humidifier is light enough to put even on your baby’s nursery and ensure the right moisture is provided to the baby. Being an ultrasonic humidifier, it means that for it to moisturize the room, water is passed through a small diaphragm where it is vibrated at ultrasonic frequency into fine droplets that make up the mist. This means that they do not have fans that can add to the noise as compared to their evaporative counterparts. This is partly what helps this humidifier stay very quiet such that you can put it in your bedroom and not have to worry about the noise level. 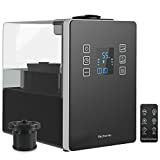 This ultrasonic humidifier is very easy to maintain and has a premium high-quality filter that takes one year to replace which greatly reduces the operating cost. Other than some occasional cleaning every one or two weeks to ensure molds and scales do not develop especially if the water being used is hard, the appliance is very easy to maintain. Without regular cleansing, accumulated mineral deposits and molds can be emitted to the air and cause or kinds of problems ranging from discolored furniture to health problems if inhaled. This humidifier has a digital control setting that has automatic configurations that can be toggled on or off allowing you to precisely dictate how much humidity you want in the house. You can also use the remote to control the display and this provides convenience especially if you feel very lazy to wake up. The display will alert you when the water in the tank is too low or shut off the appliance as soon as the tank is removed. This acts as a security feature that can prevent shocks, burns and possible fires. It also has a 7-color changing LED light that you can choose your favorite color. This dims the display light enabling you to light the room with a soothing light that you prefer. The lights illuminate the water as it wobbles giving you a nice sensation that can induce sleep for certain people. However, if you love pitch dark nights, you might consider covering the appliance with a piece of cloth or placing it in a spot where the light from the display does not face you as it does not go off which can be very annoying. The ability to change the humidifier from cold mist to warm mist is very important as you don’t have to buy two different humidifiers for different seasons. Elechomes Ultrasonic Humidifier CH601 also has an aroma compartment which provides a mixture of mist and the fragrances to help in providing fresh air with the smell of your favorite essential oil. Also, it has a timer setting whereby you can decide for how long you want the humidifier to run after which it will automatically turn itself off. Cleaning and refilling the tank is a bit easy although there have been complaints whereby some people have observed that water tend to drip all over when filling though placing a small towel under while refilling should do the job. One can choose between cool and warm mist in the same machine. Its stylish design blends well with different furniture setups. It does not save setting so it loses all your preference once it is switched off and thus have to be set again. Some people might not be comfortable with the light created by the display especially during the night when the want to sleep. It has been a week since I purchased this on Amazon. I did so based on reviews and my preference for its style that I liked. Please take Note that my review is based on a VERIFIED PURCHASE. I paid in full and I am not swayed by reviewing a "free" item. With that said, I wanted a reliable humidifier that actually works. It has been a week and it working perfectly. I love it. No issue whatsoever. I clean it after every 5 runs (as per the directions) and everything is great. The unit is whisper quiet. Overall, a fantastic humidifier that we keep next to our bed. Initially my wife wasn't enthusiastic about it as it isn't necessarily as "pretty" as the other humidifiers; however, when the mist setting is high and the nozzle is faced towards the bed, it does an amazing job of pushing the mist over our faces while we sleep." We use a humidifier in our bedroom to beat the extremely dry Arizona Sonoran Desert air at night so quiet operation was paramount in selecting a humidifier. This one really does run whisper quiet, as advertised. It's not quite as easy to use as our old humidifier that finally quit after many years of service, but I'll get it figured out. This humidifier will run until a specified humidity level is reached, then automatically shuts off. I'm still trying to figure out if the "Auto" mode will keep it running all night but in the meantime, I'm happy with the mist it produces and, most importantly, its ability to run without keeping us up at night." Elechomes Ultrasonic Humidifier CH601 is generally a good humidifier for children and for the elderly as it able to keep the noise low and be operated from a remote control. It also works on all different types of seasons to help you and your family ensure you get quality air that is free of viruses and ensures you keep all your furniture and musical instrument in good shape. It has better features and is more advanced both in design and how it operates and we would, therefore, recommend it.